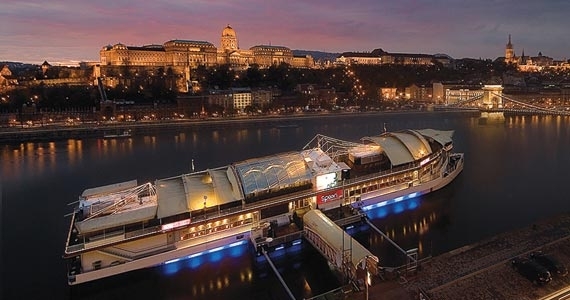 During the 1st week of March I had the pleasure of visiting the beautiful city of Budapest. Location of the 20th(!!) Oracle Fusion Middleware Partner Community Forum (#ofmForum). 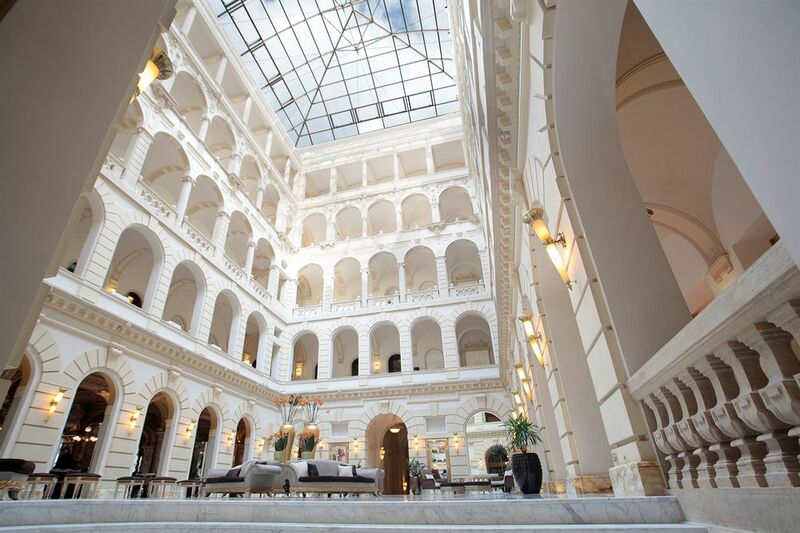 More than 180 delegates from more than 30 countries will visited the Boscolo Hotel Conference Center to share, learn and network with other Fusion Middleware minded. Oracle offered a great package for staying in the Boscolo hotel where the conference was, however in this era of “digital disruption” I decided to book a AirBNB appartment just 1 block from the hotel. Due to the amount of Oracle ACEs in Budapest, Jürgen Kress organized a sort of EMEA Oracle ACE briefing session. Where the ACE community had the opportunity to talk to both keynote speakers Andrew Sutherland and Amit Zavery. The topics where current and near-future Oracle Fusion Middleware products and PaaS Cloud Services. After Jurgens welcome speech it is time for Oracle Amit Zavery to start the community forum with a keynote. His session explains the Oracle Fusion Middleware strategy which (no surprise here) is cloud, cloud and some more cloud. Or as Amit stated himself: “Cloud is pervasive across everything we do at Oracle these days”. Cloud Platform for the digital business, was a phrase used multiple times. Andrew Sutherland (Senior Vice President of Technology and Systems) takes us on the trip explaining the digital disruption taking places in numerous markets at the moment. Think of websites/services like AirBNB, Spotify, Uber that are immediate threats to the current order counterparts. Board rooms should be scared of Digital Disruption. Digital Business needs both speed and agility. Modern business is all about real time and we should avoid processes which depends on batches. The session explained important elements of service integration with both the current Oracle SOA Suite 12c and the future roadmap for Oracle towards the cloud. Including a sneak peek to the soon to be released Integration Cloud Service (ICS). The session also allowed for a great presentation (and live demo) about Stream Explorer 12c by Oracle ACE Director Lucas Jellema. With the release of Oracle BPM 12c some new features were added to allow better (web based) modelling and on the other hand improve developer productivity. Not strange, since the same web interface will be used for the soon to be released Process Cloud Service. The session also allowed us to get a sneak peak of the new Process Cloud Service which is a fully self-service, PaaS service on the Oracle Public Cloud that allows for complete life cycle management of processes. The (official) part of day 1 ended with a dinner hosted by Oracle at the Spoon restaurant boat in the Donau river. While meeting old friends (and creating new ones) enjoying the fantastic diner with a marvelous view on the Buda Castle. Robert van Molken & Yogesh Sontakke present the Oracle vision on API management.API management is about managing, discover, govern, monitor, and support your business APIs (services). The presenters first showed the highover positioning of products like Oracle API Catalog, Oracle API Gateway, Oracle API Manager & Oracle Service Bus. Later Robert went in depth for us showing details how to use the Oracle API Catalog with a live demo (very brave) and Yogesh did the same with the Oracle API Manager. Presented by both Danilo Schmiedel & Andrejus Baranovskis telling their experiences about implementation of ACM at 3 different (insurance) companies. Danilo first started with the characteristics of unstructured processes and the requirements that knowledge workers have on the IT solution. Also the importance of early-on case UI design is essential to achieve insight on business information requirements. Needed for dynamic case management is the definition of your activities, milestones, rules, events, data & case stakeholders. Danilo also mentions the ProM Tools for Process Mining research and extraction of knowledge about a (business) process from its process execution logs. Surely need to look at that. After the session there was a very valuable talk with Dirk Janssen, Harrie van Oosten & Danilo Schmiedel to share experiences we with the Oracle BPM/ACM implementations in both Germany and the Netherlands. Finalized my stay in Budapest with a great diner in the hills of Buda. Last OOW I visited the presentation of Danilo Schmiedel (blog & twitter) and Andrejus Baranovskis (blog & twitter) covering the topic “Oracle BPM & Oracle ADF” integration best practices. With my experience in BEA AquaLogic BPM 6 and Oracle BPM 10 the ADF integration in 11g was all new for me, so with just playing around with it I was very interested in the best practices.combining these 2 Oracle technologies for rich user interfaces. So last month we started our Oracle BPM 11g project and during “sprint 0” we came to the conclusion that we would have long-running instances with a lot of human interaction and discussed the look-and-feel posibilities with our teams user experience expert. So a good time to look back upon the best practices from both gentlemans. So we used their presentation and advice to discuss the option of creating a generic ADF human task handler. Check out Danilo’s blogpost about their presentation yourself and off course the presentation on slideshare. Oracle Open World 2012 – it’s a wrap ! After 5 days with many sessions, keynotes, hands-on-labs and even more parties we can call it a week. Fantastic meeting old and new colleagues/friends/partners and more. Oracle Open World 2012 ended with a blast! 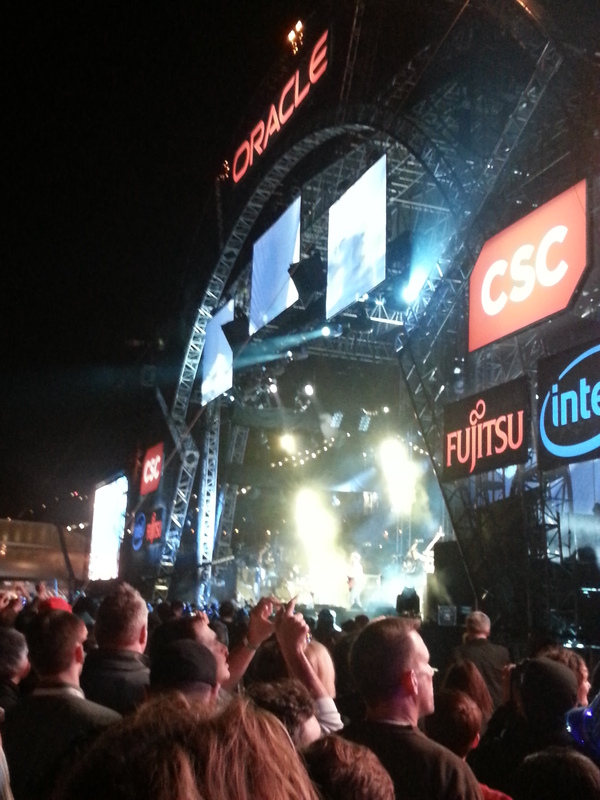 While the blue angels made a fly by above Yerba Buena Gardens the Swedish garage rock band The Hives showed the Oracle crowd why they won awards for being the best live act. Tomorrow we will return home, hoping to see you all again next year! 4th day of the Oracle Open World conference and today my amount of sessions visited was clearly decreasing. The session gave a lof of tips and best practices for running a BPM project in general (not purely Oracle BPM as a product). SOA reference architecture. Lessons learned. No super composite. Make sure to always decouple human task complex payload from the process: use keys in the process, pass it to the human task. Do NOT import complex models (large xsds as human task payload), implement proper validation, leverage validation callback. When assigning task to a performer: always use group assignments mapped against authorization repository, or leverage oracle entitlement server. 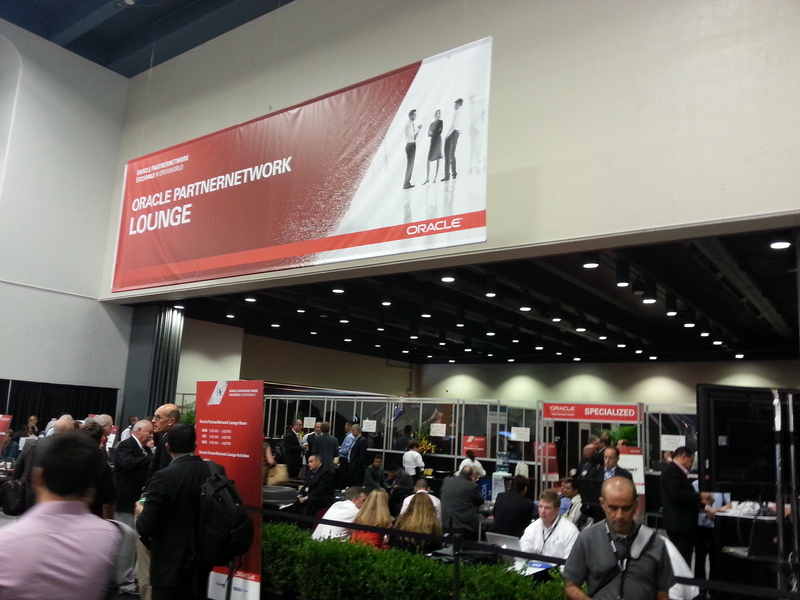 Visited the Oracle Partner Network lounge in Moscone South and talked with some other Oracle partners who also visited Oracle Open World this year. Highlight of this years Oracle Open World was obviously the appreciation event held on wednesday evening. As always the event is arranged perfectly with massive amounts of people traveling to and from Treasure Island, and of course the huge amount of food and beverage being offered to all the attendees. Pearl Jam closing the night with a fabulous tribute to The Who with their song Baba O’Riley !!! Not much session today but watched 2 keynotes, walked the demo grounds and attended only 1 Oracle BPM/ADF session which was very good. Very good session by Danilo Schmiedel and Andrejus Baranovskis explaining the best practices for the intregration points between Oracle BPM and Oracle ADF. By default you can use the BPM workspace application or create a custom ADF application where you need to import the BPM workspace JAR libraries. Session started with explanation about the complexity challenges both gentlemen had at their project. A project where long running processes where created, each with a huge amount of human tasks and a load of over 300.000 instances/year. To prevent creating huge amounts of ADF artifacts for each human task, they created a common data model for the human tasks and use standardization. The generic ADF Human Task Handler then uses routing on security groups an generate/render the correct options (buttons) for that task based upon an external configuration. I found this very interesting and need to look into this further when back home. During the session some administrative reminders where made about the complex Oracle BPM environment as it existed in their project. “Housekeeping” was the term used, and reminded us to monitor the filesystem, configure Enterprise Manager correctly, arrange proper monitoring, use JRockit Mission Control for tuning and manage the database growth (MDS / SOAINFRA). Make sure you think about purging and read the Oracle Fusion Middleware administration guide about managing database growth. Ended the night in style in one of the hottest clubs in San Francisco, the Ruby Skye. The event was open for Oracle customers, partners and employees from the Benelux region. Party made possible by the Oracle partners VXCompany and Qualogy.